Oh, Pinterest, you give me so many ideas. I saw this quilt pinned a couple months ago and right away knew what I would do with the idea. I love how simple and graphic it is and the strong shape. A big part of the Kindergarten math curriculum at my school is learning the 5 basic geometric shapes (circle, square, triangle, rectangle, ellipse) and I like to support that however I can. 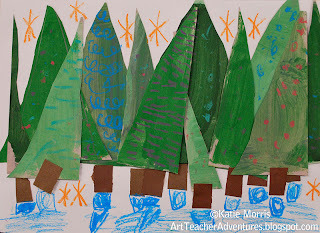 Last year we did wax-resist pyramid paintings for "triangle" but I wanted to try something wintery this year, and this was an easy 2-3 class period project. 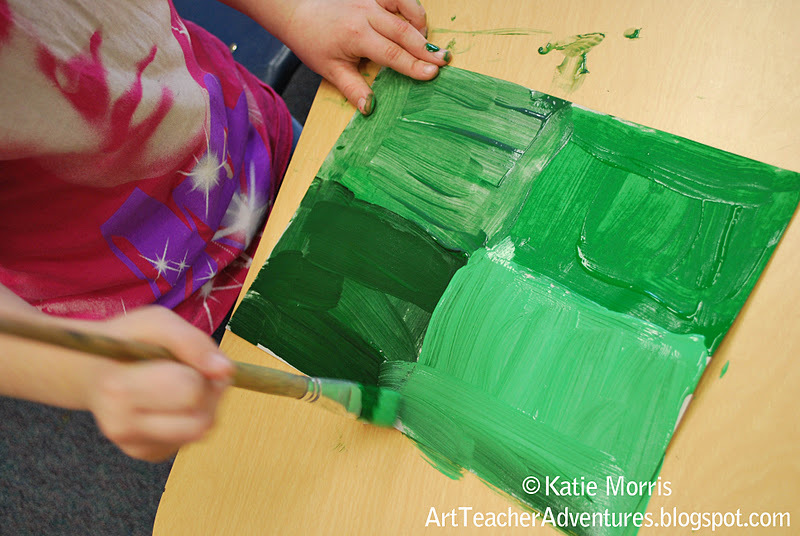 Day 1: Using tempera to paint 4 different greens. 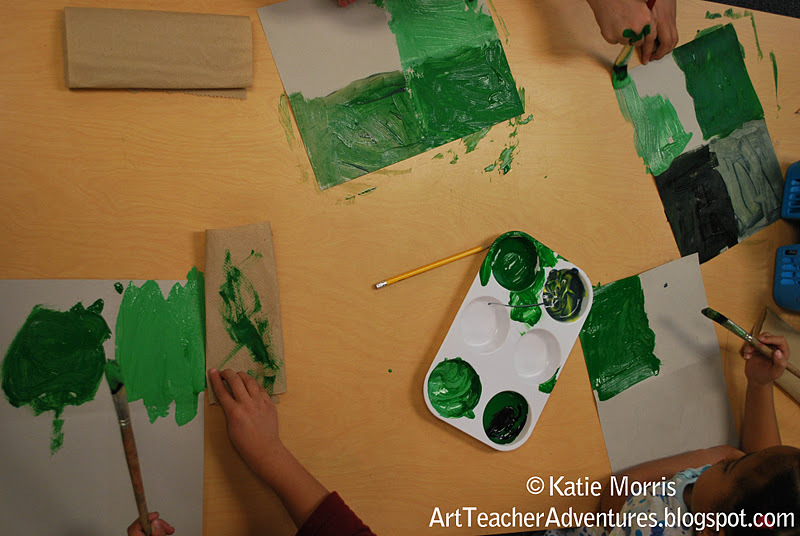 Before painting, students folded their papers hotdog and hamburger style to make a "t" down the middle. Reviewed paintbrush technique but not cleaning since no water is required for this as long as you do the shade last. Just rinse brushes at the end of class! 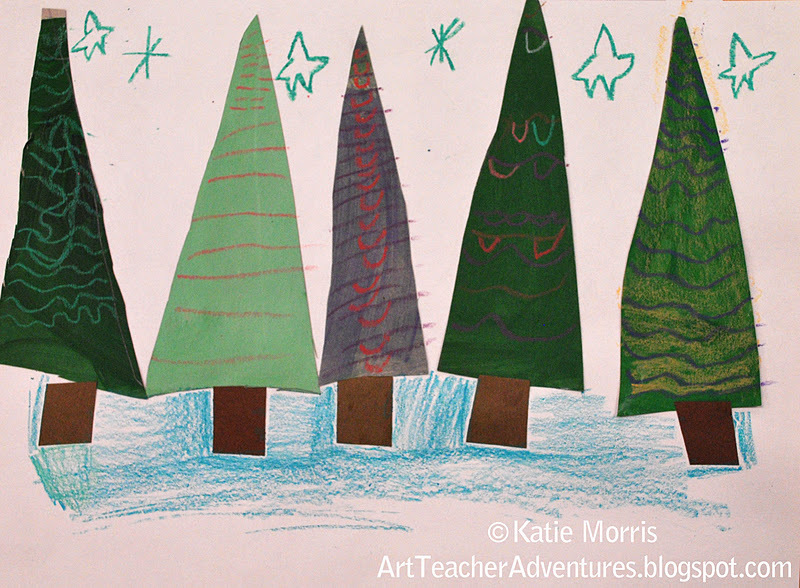 Day 2: Make some trees! We discussed the quilt picture, students identified the shapes, and pointed out the different colors and patterns. 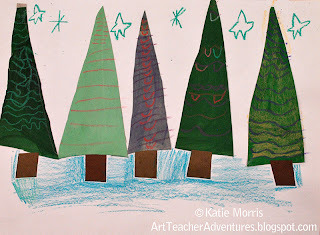 I asked the students to tell me what they were looking at a picture of and most said "Christmas trees" (it was December, after all), and I used that opportunity to put in a quick science lesson about evergreen trees. 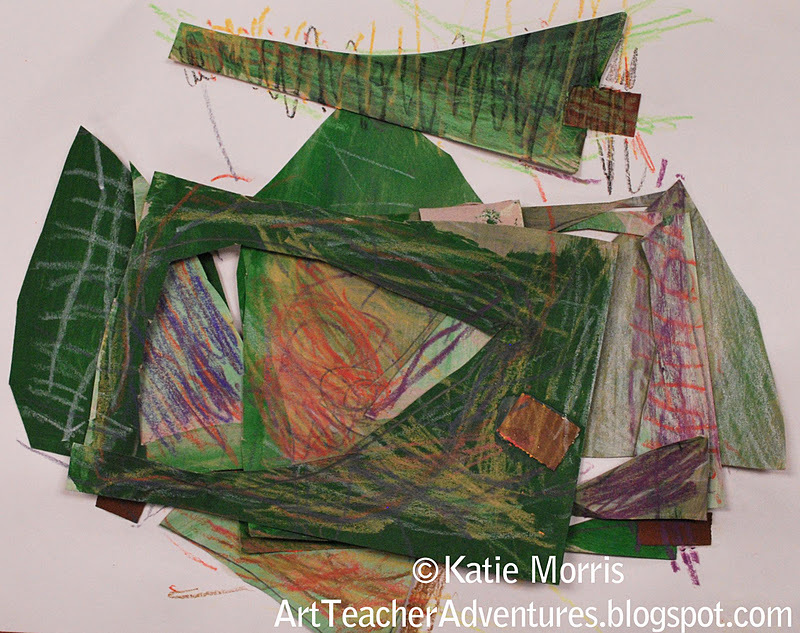 Next, we cut the papers into 4 sections and I showed how to cut triangles. 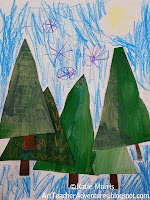 I gave students the choice between drawing triangles first or "drawing with scissors". 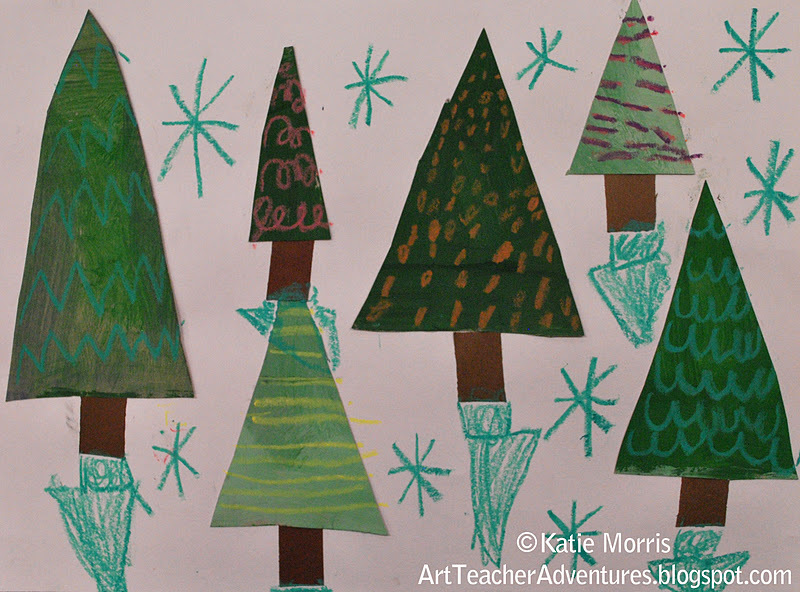 I tried to get them to cut their first 4 triangles so big that they touched the top AND the bottom of the painted paper then they could use the scraps to make "baby" trees. I had pre-cut, or more like chopped since I definitely didn't measure, some brown pieces for trunks. We covered "just a dot, not a lot" for glue bottle use and they went at it. *Tip- Save the painted paper scraps for students who missed the painting day. Day 3: Some students would have had time for this at the end of the 2nd class but I decided to utilize "peer tutoring" and have them help struggling classmates with their gluing instead. In the beginning of the 3rd class, we reviewed different kinds of lines and practiced drawing them in the air with our fingers. I have no actual proof, but I'm convinced that getting the kinesthetic action helps the students remember it better. And it's a little silly and fun. 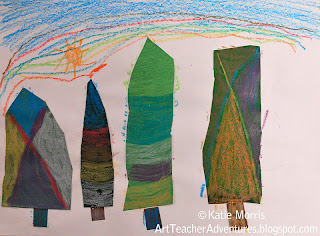 After our practice, the students used construction paper crayons to add patterns to their trees. I told the students about shadows and gave a 30 second demonstration. Most tried to add shadows then added other details in the background. I had a couple students who missed the first 2 classes so they just made construction paper crayon drawings of patterned trees. 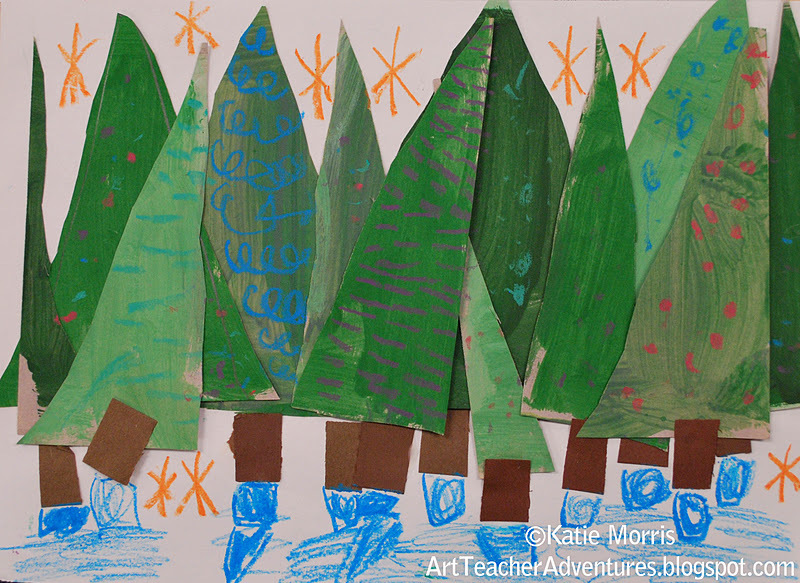 This student said she made a whole forest. 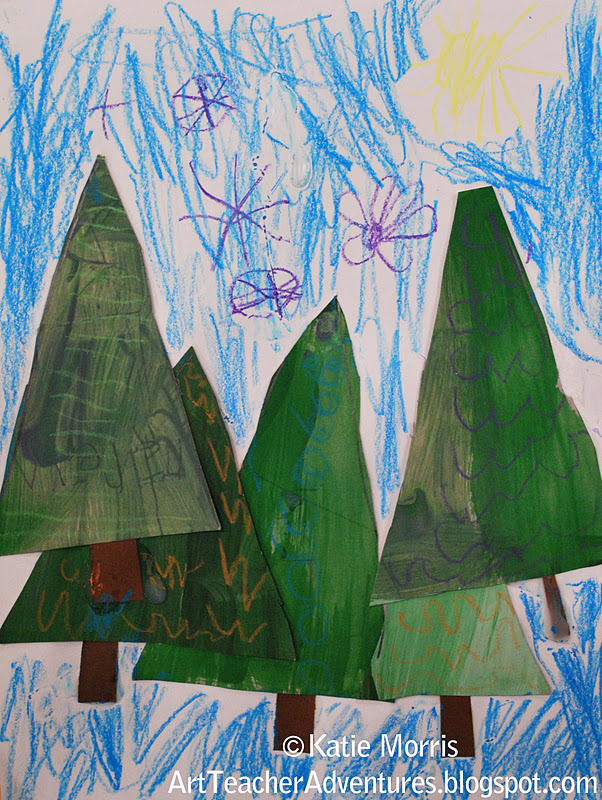 It may look like this student was just being sloppy by gluing every scrap of paper she could find onto her background, but she had a whole story about how all the trees in her forest fell down. 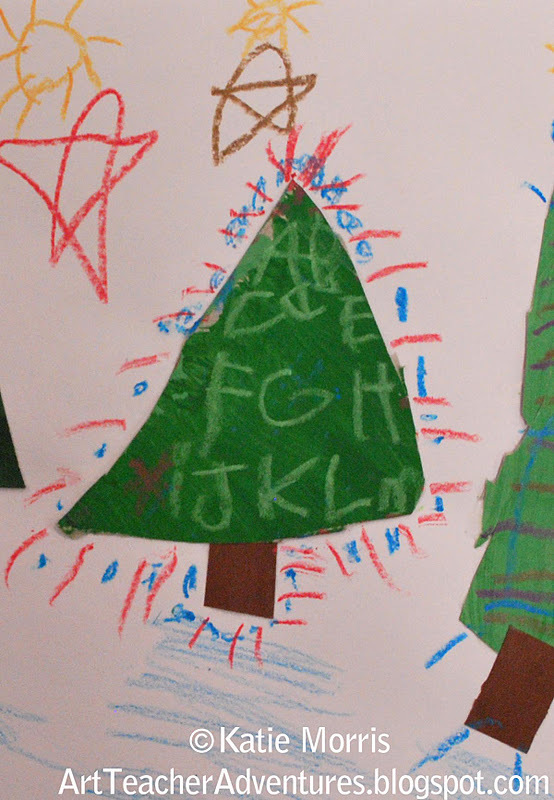 I love the letters on this tree! *I forgot to say earlier that this is doable as a sub plan. I was there for every painting class but was gone for one afternoon of gluing and another afternoon of adding patterns. 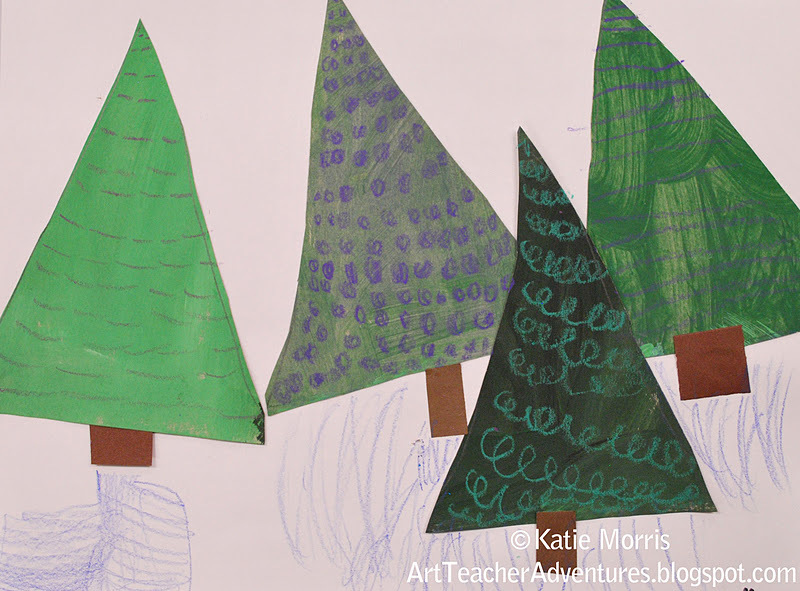 I was afraid it might turn out too cookie cutter but I think it's ok since nobody traced anything and the students were free to add whatever colors and patterns they wanted on trees they placed wherever they wanted. Nice idea, and it looks like the kids really followed through. Lovely results! Katie, this is so cute. But I think I will do it with 1st instead. My K group would have to do it in small centers. Hey congrats I saw the post you won Art Ed Blog of the year, 7th! Pretty good for a Ks. girl! Hello the above quilt looks very similar to Charley Harper.I use his artwork fot a lesson with birds. Guess what?! I did it with my Kinders, just slightly different. I just did a blog post on it. Thanks Katie! This is great -- I appreciate a project that teaches something about art but isn't too complicated. Thanks!